Have you tried Organic SunButter? If yes, what is your favorite way to eat it? If no, what will be your first way to try it out? Like the A Gift of Miles or Smart Allergy~Friendly Education's Facebook pages and answer the above questions. 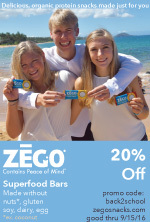 One winner will win a FREE jar of Organic SunButter and another will win a SunButter coupon. Kristin will choose two winners from her A Gift of Miles fans and I will choose two winners from my Smart Allergy~Friendly Education fans! Winners will be chosen via Random.org on Friday morning, November 11th. We want to thank SunButter for their support of our national telephone workshop, Holiday & Celebration FUN with Dietary Restrictions on November 12th. 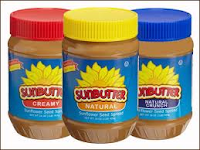 Sunbutter products are completely peanut-free, tree nut-free, and gluten-free. It is made from roasted sunflower seeds. The sunflower seed spread products are all processed in a peanut-free and tree-nut free facility, making them an excellent choice for people with peanut allergies or gluten intolerance. They have quite the variety available! Here are just a few samples: Creamy, Natural Crunch, Natural N0-Stir Creamy, 5 lb pails and check out their On-The-Go Snack Packs! These are great for lunches!! We love the Creamy SunButter by the spoonful with our favorite dairy-free chocolate chips! Our homemade SunButter cups are even better than Reese's! On behalf of Kristin and I, GOOD LUCK! 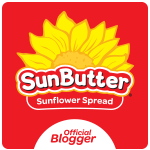 I tried the Sunbutter at the FAAN walk this year...and I liked it. I had it on wheat toast. Although I can eat peanut butter, I like Sunbutter too! I’m a Gift of Miles FB fan (Mari Doug). I'd have Sunbutter on apples. Sunbutter sounds like it would be great in a sandwich, or make ants on a log with celery!